Liczba stron: 527 Jest to ujednolicona liczba stron, która ułatwi Ci porównanie długości książek. Każda strona Legimi to 200 słów. That the contemporary lords of the manor, the businessmen who own the means of production, have employed themselves in the economically unproductive practices of conspicuous consumption and conspicuous leisure, which are useless activities that contribute neither to the economy nor to the material production of the useful goods and services required for the functioning of society; while it is the middle class and the working class who are usefully employed in the industrialised, productive occupations that support the whole of society. Conducted in the late 19th century, Veblen’s socio-economic analyses of the business cycles and the consequent price politics of the U.S. economy, and of the emergent division of labour, by technocratic speciality — scientist, engineer, technologist, et al. — proved to be accurate, sociological predictions of the economic structure of an industrial society.. Thank you for reading. If you enjoy this book, please leave a review. THE INSTITUTION OF A LEISURE class is found in its best development at the higher stages of the barbarian culture; as, for instance, in feudal Europe or feudal Japan. In such communities the distinction between classes is very rigorously observed; and the feature of most striking economic significance in these class differences is the distinction maintained between the employments proper to the several classes. The upper classes are by custom exempt or excluded from industrial occupations, and are reserved for certain employments to which a degree of honour attaches. Chief among the honourable employments in any feudal community is warfare; and priestly service is commonly second to warfare. If the barbarian community is not notably warlike, the priestly office may take the precedence, with that of the warrior second. But the rule holds with but slight exceptions that, whether warriors or priests, the upper classes are exempt from industrial employments, and this exemption is the economic expression of their superior rank. Brahmin India affords a fair illustration of the industrial exemption of both these classes. In the communities belonging to the higher barbarian culture there is a considerable differentiation of sub-classes within what may be comprehensively called the leisure class; and there is a corresponding differentiation of employments between these sub-classes. The leisure class as a whole comprises the noble and the priestly classes, together with much of their retinue. The occupations of the class are correspondingly diversified; but they have the common economic characteristic of being non-industrial. These non-industrial upper-class occupations may be roughly comprised under government, warfare, religious observances, and sports. At an earlier, but not the earliest, stage of barbarism, the leisure class is found in a less differentiated form. Neither the class distinctions nor the distinctions between leisure-class occupations are so minute and intricate. The Polynesian islanders generally show this stage of the development in good form, with the exception that, owing to the absence of large game, hunting does not hold the usual place of honour in their scheme of life. The Icelandic community in the time of the Sagas also affords a fair instance. In such a community there is a rigorous distinction between classes and between the occupations peculiar to each class. Manual labour, industry, whatever has to do directly with the everyday work of getting a livelihood, is the exclusive occupation of the inferior class. This inferior class includes slaves and other dependents, and ordinarily also all the women. If there are several grades of aristocracy, the women of high rank are commonly exempt from industrial employment, or at least from the more vulgar kinds of manual labour. The men of the upper classes are not only exempt, but by prescriptive custom they are debarred, from all industrial occupations. The range of employments open to them is rigidly defined. As on the higher plane already spoken of, these employments are government, warfare, religious observances, and sports. These four lines of activity govern the scheme of life of the upper classes, and for the highest rank—the kings or chieftains—these are the only kinds of activity that custom or the common sense of the community will allow. Indeed, where the scheme is well developed even sports are accounted doubtfully legitimate for the members of the highest rank. To the lower grades of the leisure class certain other employments are open, but they are employments that are subsidiary to one or another of these typical leisure-class occupations. Such are, for instance, the manufacture and care of arms and accoutrements and of war canoes, the dressing and handling of horses, dogs, and hawks, the preparation of sacred apparatus, etc. The lower classes are excluded from these secondary honourable employments, except from such as are plainly of an industrial character and are only remotely related to the typical leisure-class occupations. If we go a step back of this exemplary barbarian culture, into the lower stages of barbarism, we no longer find the leisure class in fully developed form. But this lower barbarism shows the usages, motives, and circumstances out of which the institution of a leisure class has arisen, and indicates the steps of its early growth. Nomadic hunting tribes in various parts of the world illustrate these more primitive phases of the differentiation. Any one of the North American hunting tribes may be taken as a convenient illustration. These tribes can scarcely be said to have a defined leisure class. There is a differentiation of function, and there is a distinction between classes on the basis of this difference of function, but the exemption of the superior class from work has not gone far enough to make the designation “leisure class” altogether applicable. The tribes belonging on this economic level have carried the economic differentiation to the point at which a marked distinction is made between the occupations of men and women, and this distinction is of an invidious character. In nearly all these tribes the women are, by prescriptive custom, held to those employments out of which the industrial occupations proper develop at the next advance. The men are exempt from these vulgar employments and are reserved for war, hunting, sports, and devout observances. A very nice discrimination is ordinarily shown in this matter. This division of labour coincides with the distinction between the working and the leisure class as it appears in the higher barbarian culture. As the diversification and specialisation of employments proceed, the line of demarcation so drawn comes to divide the industrial from the non-industrial employments. The man’s occupation as it stands at the earlier barbarian stage is not the original out of which any appreciable portion of later industry has developed. In the later development it survives only in employments that are not classed as industrial,—war, politics, sports, learning, and the priestly office. The only notable exceptions are a portion of the fishery industry and certain slight employments that are doubtfully to be classed as industry; such as the manufacture of arms, toys, and sporting goods. Virtually the whole range of industrial employments is an outgrowth of what is classed as woman’s work in the primitive barbarian community. The work of the men in the lower barbarian culture is no less indispensable to the life of the group than the work done by the women. It may even be that the men’s work contributes as much to the food supply and the other necessary consumption of the group. Indeed, so obvious is this “productive” character of the men’s work that in the conventional economic writings the hunter’s work is taken as the type of primitive industry. But such is not the barbarian’s sense of the matter. In his own eyes he is not a labourer, and he is not to be classed with the women in this respect; nor is his effort to be classed with the women’s drudgery, as labour or industry, in such a sense as to admit of its being confounded with the latter. There is in all barbarian communities a profound sense of the disparity between man’s and woman’s work. His work may conduce to the maintenance of the group, but it is felt that it does so through an excellence and an efficacy of a kind that cannot without derogation be compared with the uneventful diligence of the women. At a farther step backward in the cultural scale—among savage groups—the differentiation of employments is still less elaborate and the invidious distinction between classes and employments is less consistent and less rigorous. Unequivocal instances of a primitive savage culture are hard to find. Few of these groups or communities that are classed as “savage” show no traces of regression from a more advanced cultural stage. But there are groups—some of them apparently not the result of retrogression—which show the traits of primitive savagery with some fidelity. Their culture differs from that of the barbarian communities in the absence of a leisure class and the absence, in great measure, of the animus or spiritual attitude on which the institution of a leisure class rests. These communities of primitive savages in which there is no hierarchy of economic classes make up but a small and inconspicuous fraction of the human race. As good an instance of this phase of culture as may be had is afforded by the tribes of the Andamans, or by the Todas of the Nilgiri Hills. The scheme of life of these groups at the time of their earliest contact with Europeans seems to have been nearly typical, so far as regards the absence of a leisure class. As a further instance might be cited the Ainu of Yezo, and, more doubtfully, also some Bushman and Eskimo groups. Some Pueblo communities are less confidently to be included in the same class. Most, if not all, of the communities here cited may well be cases of degeneration from a higher barbarism, rather than bearers of a culture that has never risen above its present level. If so, they are for the present purpose to be taken with the allowance, but they may serve none the less as evidence to the same effect as if they were really “primitive” populations. These communities that are without a defined leisure class resemble one another also in certain other features of their social structure and manner of life. They are small groups and of a simple (archaic) structure; they are commonly peaceable and sedentary; they are poor; and individual ownership is not a dominant feature of their economic system. At the same time it does not follow that these are the smallest of existing communities, or that their social structure is in all respects the least differentiated; nor does the class necessarily include all primitive communities which have no defined system of individual ownership. But it is to be noted that the class seems to include the most peaceable—perhaps all the characteristically peaceable—primitive groups of men. Indeed, the most notable trait common to members of such communities is a certain amiable inefficiency when confronted with force or fraud. The evidence afforded by the usages and cultural traits of communities at a low stage of development indicates that the institution of a leisure class has emerged gradually during the transition from primitive savagery to barbarism; or more precisely, during the transition from a peaceable to a consistently warlike habit of life. The conditions apparently necessary to its emergence in a consistent form are: (1) the community must be of a predatory habit of life (war or the hunting of large game or both); that is to say, the men, who constitute the inchoate leisure class in these cases, must be habituated to the infliction of injury by force and stratagem; (2) subsistence must be obtainable on sufficiently easy terms to admit of the exemption of a considerable portion of the community from steady application to a routine of labour. The institution of leisure class is the outgrowth of an early discrimination between employments, according to which some employments are worthy and others unworthy. Under this ancient distinction the worthy employments are those which may be classed as exploit; unworthy are those necessary everyday employments into which no appreciable element of exploit enters. This distinction has but little obvious significance in a modern industrial community, and it has, therefore, received but slight attention at the hands of economic writers. When viewed in the light of that modern common sense which has guided economic discussion, it seems formal and insubstantial. But it persists with great tenacity as a commonplace preconception even in modern life, as is shown, for instance, by our habitual aversion to menial employments. It is a distinction of a personal kind—of superiority and inferiority. In the earlier stages of culture, when the personal force of the individual counted more immediately and obviously in shaping the course of events, the element of exploit counted for more in the everyday scheme of life. Interest centred about this fact to a greater degree. Consequently a distinction proceeding on this ground seemed more imperative and more definitive then than is the case to-day. As a fact in the sequence of development, therefore, the distinction is a substantial one and rests on sufficiently valid and cogent grounds. The ground on which a discrimination between facts is habitually made changes as the interest from which the facts are habitually viewed changes. Those features of the facts at hand are salient and substantial upon which the dominant interest of the time throws its light. Any given ground of distinction will seem insubstantial to any one who habitually apprehends the facts in question from a different point of view and values them for a different purpose. The habit of distinguishing and classifying the various purposes and directions of activity prevails of necessity always and everywhere; for it is indispensable in reaching a working theory or scheme of life. The particular point of view, or the particular characteristic that is pitched upon as definitive in the classification of the facts of life depends upon the interest from which a discrimination of the facts is sought. The grounds of discrimination, and the norm of procedure in classifying the facts, therefore, progressively change as the growth of culture proceeds; for the end for which the facts of life are apprehended changes, and the point of view consequently changes also. So that what are recognised as the salient and decisive features of a class of activities or of a social class at one stage of culture will not retain the same relative importance for the purposes of classification at any subsequent stage. But the change of standards and points of view is gradual only, and it seldom results in the subversion or entire suppression of a standpoint once accepted. A distinction is still habitually made between industrial and non-industrial occupations; and this modern distinction is a transmuted form of the barbarian distinction between exploit and drudgery. Such employments as warfare, politics, public worship, and public merrymaking, are felt, in the popular apprehension, to differ intrinsically from the labour that has to do with elaborating the material means of life. The precise line of demarcation is not the same as it was in the early barbarian scheme, but the broad distinction has not fallen into disuse. The tacit, common-sense distinction to-day is, in effect, that any effort is to be accounted industrial only so far as its ultimate purpose is the utilisation of non-human things. The coercive utilisation of man by man is not felt to be an industrial function; but all effort directed to enhance human life by taking advantage of the non-human environment is classed together as industrial activity. By the economists who have best retained and adapted the classical tradition, man’s “power over nature” is currently postulated as the characteristic fact of industrial productivity. This industrial power over nature is taken to include man’s power over the life of the beasts and over all the elemental forces. A line is in this way drawn between mankind and brute creation. In other times and among men imbued with a different body of preconceptions this line is not drawn precisely as we draw it to-day. In the savage or the barbarian scheme of life it is drawn in a different place and in another way. In all communities under the barbarian culture there is an alert and pervading sense of antithesis between two comprehensive groups of phenomena, in one of which barbarian man includes himself, and in the other, his victual. There is a felt antithesis between economic and non-economic phenomena, but it is not conceived in the modern fashion; it lies not between man and brute creation, but between animate and inert things. It may be an excess of caution at this day to explain that the barbarian notion which it is here intended to convey by the term “animate” is not the same as would be conveyed by the word “living”. The term does not cover all living things, and it does cover a great many others. Such a striking natural phenomenon as a storm, a disease, a waterfall, are recognised as “animate”; while fruits and herbs, and even inconspicuous animals, such as house-flies, maggots, lemmings, sheep, are not ordinarily apprehended as “animate” except when taken collectively. As here used the term does not necessarily imply an indwelling soul or spirit. The concept includes such things as in the apprehension of the animistic savage or barbarian are formidable by virtue of a real or imputed habit of initiating action. This category comprises a large number and range of natural objects and phenomena. Such a distinction between the inert and the active is still present in the habits of thought of unreflecting persons, and it still profoundly affects the prevalent theory of human life and of natural processes; but it does not pervade our daily life to the extent or with the far-reaching practical consequences that are apparent at earlier stages of culture and belief. To the mind of the barbarian, the elaboration and utilisation of what is afforded by inert nature is activity on quite a different plane from his dealings with “animate” things and forces. The line of demarcation may be vague and shifting, but the broad distinction is sufficiently real and cogent to influence the barbarian scheme of life. To the class of things apprehended as animate, the barbarian fancy imputes an unfolding of activity directed to some end. It is this teleological unfolding of activity that constitutes any object or phenomenon an “animate” fact. Wherever the unsophisticated savage or barbarian meets with activity that is at all obtrusive, he construes it in the only terms that are ready to hand—the terms immediately given in his consciousness of his own actions. Activity is, therefore, assimilated to human action, and active objects are in so far assimilated to the human agent. Phenomena of this character—especially those whose behaviour is notably formidable or baffling—have to be met in a different spirit and with proficiency of a different kind from what is required in dealing with inert things. To deal successfully with such phenomena is a work of exploit rather than of industry. It is an assertion of prowess, not of diligence. Under the guidance of this naive discrimination between the inert and the animate, the activities of the primitive social group tend to fall into two classes, which would in modern phrase be called exploit and industry. Industry is effort that goes to create a new thing, with a new purpose given it by the fashioning hand of its maker out of passive ("brute") material; while exploit, so far as it results in an outcome useful to the agent, is the conversion to his own ends of energies previously directed to some other end by an other agent. We still speak of “brute matter” with something of the barbarian’s realisation of a profound significance in the term. The distinction between exploit and drudgery coincides with a difference between the sexes. The sexes differ, not only in stature and muscular force, but perhaps even more decisively in temperament, and this must early have given rise to a corresponding division of labour. The general range of activities that come under the head of exploit falls to the males as being the stouter, more massive, better capable of a sudden and violent strain, and more readily inclined to self assertion, active emulation, and aggression. The difference in mass, in physiological character, and in temperament may be slight among the members of the primitive group; it appears, in fact, to be relatively slight and inconsequential in some of the more archaic communities with which we are acquainted—as for instance the tribes of the Andamans. But so soon as a differentiation of function has well begun on the lines marked out by this difference in physique and animus, the original difference between the sexes will itself widen. A cumulative process of selective adaptation to the new distribution of employments will set in, especially if the habitat or the fauna with which the group is in contact is such as to call for a considerable exercise of the sturdier virtues. The habitual pursuit of large game requires more of the manly qualities of massiveness, agility, and ferocity, and it can therefore scarcely fail to hasten and widen the differentiation of functions between the sexes. And so soon as the group comes into hostile contact with other groups, the divergence of function will take on the developed form of a distinction between exploit and industry. In such a predatory group of hunters it comes to be the able-bodied men’s office to fight and hunt. The women do what other work there is to do—other members who are unfit for man’s work being for this purpose classed with women. But the men’s hunting and fighting are both of the same general character. Both are of a predatory nature; the warrior and the hunter alike reap where they have not strewn. Their aggressive assertion of force and sagacity differs obviously from the women’s assiduous and uneventful shaping of materials; it is not to be accounted productive labour but rather an acquisition of substance by seizure. Such being the barbarian man’s work, in its best development and widest divergence from women’s work, any effort that does not involve an assertion of prowess comes to be unworthy of the man. As the tradition gains consistency, the common sense of the community erects it into a canon of conduct; so that no employment and no acquisition is morally possible to the self respecting man at this cultural stage, except such as proceeds on the basis of prowess—force or fraud. When the predatory habit of life has been settled upon the group by long habituation, it becomes the able-bodied man’s accredited office in the social economy to kill, to destroy such competitors in the struggle for existence as attempt to resist or elude him, to overcome and reduce to subservience those alien forces that assert themselves refractorily in the environment. So tenaciously and with such nicety is this theoretical distinction between exploit and drudgery adhered to that in many hunting tribes the man must not bring home the game which he has killed, but must send his woman to perform that baser office. As has already been indicated, the distinction between exploit and drudgery is an invidious distinction between employments. Those employments which are to be classed as exploit are worthy, honourable, noble; other employments, which do not contain this element of exploit, and especially those which imply subservience or submission, are unworthy, debasing, ignoble. The concept of dignity, worth, or honour, as applied either to persons or conduct, is of first-rate consequence in the development of classes and of class distinctions, and it is therefore necessary to say something of its derivation and meaning. Its psychological ground may be indicated in outline as follows. As a matter of selective necessity, man is an agent. He is, in his own apprehension, a centre of unfolding impulsive activity—"teleological” activity. He is an agent seeking in every act the accomplishment of some concrete, objective, impersonal end. By force of his being such an agent he is possessed of a taste for effective work, and a distaste for futile effort. He has a sense of the merit of serviceability or efficiency and of the demerit of futility, waste, or incapacity. This aptitude or propensity may be called the instinct of workmanship. Wherever the circumstances or traditions of life lead to an habitual comparison of one person with another in point of efficiency, the instinct of workmanship works out in an emulative or invidious comparison of persons. The extent to which this result follows depends in some considerable degree on the temperament of the population. In any community where such an invidious comparison of persons is habitually made, visible success becomes an end sought for its own utility as a basis of esteem. Esteem is gained and dispraise is avoided by putting one’s efficiency in evidence. The result is that the instinct of workmanship works out in an emulative demonstration of force. During that primitive phase of social development, when the community is still habitually peaceable, perhaps sedentary, and without a developed system of individual ownership, the efficiency of the individual can be shown chiefly and most consistently in some employment that goes to further the life of the group. What emulation of an economic kind there is between the members of such a group will be chiefly emulation in industrial serviceability. At the same time the incentive to emulation is not strong, nor is the scope for emulation large. When the community passes from peaceable savagery to a predatory phase of life, the conditions of emulation change. The opportunity and the incentive to emulate increase greatly in scope and urgency. The activity of the men more and more takes on the character of exploit; and an invidious comparison of one hunter or warrior with another grows continually easier and more habitual. Tangible evidences of prowess—trophies—find a place in men’s habits of thought as an essential feature of the paraphernalia of life. Booty, trophies of the chase or of the raid, come to be prized as evidence of pre-eminent force. Aggression becomes the accredited form of action, and booty serves as prima facie evidence of successful aggression. As accepted at this cultural stage, the accredited, worthy form of self-assertion is contest; and useful articles or services obtained by seizure or compulsion, serve as a conventional evidence of successful contest. Therefore, by contrast, the obtaining of goods by other methods than seizure comes to be accounted unworthy of man in his best estate. The performance of productive work, or employment in personal service, falls under the same odium for the same reason. An invidious distinction in this way arises between exploit and acquisition on the other hand. Labour acquires a character of irksomeness by virtue of the indignity imputed to it. With the primitive barbarian, before the simple content of the notion has been obscured by its own ramifications and by a secondary growth of cognate ideas, “honourable” seems to connote nothing else than assertion of superior force. “Honourable” is “formidable”; “worthy” is “prepotent”. A honorific act is in the last analysis little if anything else than a recognised successful act of aggression; and where aggression means conflict with men and beasts, the activity which comes to be especially and primarily honourable is the assertion of the strong hand. The naive, archaic habit of construing all manifestations of force in terms of personality or “will power” greatly fortifies this conventional exaltation of the strong hand. Honorific epithets, in vogue among barbarian tribes as well as among peoples of a more advance culture, commonly bear the stamp of this unsophisticated sense of honour. Epithets and titles used in addressing chieftains, and in the propitiation of kings and gods, very commonly impute a propensity for overbearing violence and an irresistible devastating force to the person who is to be propitiated. This holds true to an extent also in the more civilised communities of the present day. The predilection shown in heraldic devices for the more rapacious beasts and birds of prey goes to enforce the same view. Under this common-sense barbarian appreciation of worth or honour, the taking of life—the killing of formidable competitors, whether brute or human—is honourable in the highest degree. And this high office of slaughter, as an expression of the slayer’s prepotence, casts a glamour of worth over every act of slaughter and over all the tools and accessories of the act. Arms are honourable, and the use of them, even in seeking the life of the meanest creatures of the fields, becomes a honorific employment. At the same time, employment in industry becomes correspondingly odious, and, in the common-sense apprehension, the handling of the tools and implements of industry falls beneath the dignity of able-bodied men. Labour becomes irksome. It is here assumed that in the sequence of cultural evolution primitive groups of men have passed from an initial peaceable stage to a subsequent stage at which fighting is the avowed and characteristic employment of the group. But it is not implied that there has been an abrupt transition from unbroken peace and good-will to a later or higher phase of life in which the fact of combat occurs for the first time. Neither is it implied that all peaceful industry disappears on the transition to the predatory phase of culture. Some fighting, it is safe to say, would be met with at any early stage of social development. Fights would occur with more or less frequency through sexual competition. The known habits of primitive groups, as well as the habits of the anthropoid apes, argue to that effect, and the evidence from the well-known promptings of human nature enforces the same view. It may therefore be objected that there can have been no such initial stage of peaceable life as is here assumed. There is no point in cultural evolution prior to which fighting does not occur. But the point in question is not as to the occurrence of combat, occasional or sporadic, or even more or less frequent and habitual; it is a question as to the occurrence of an habitual; it is a question as to the occurrence of an habitual bellicose frame of mind—a prevalent habit of judging facts and events from the point of view of the fight. The predatory phase of culture is attained only when the predatory attitude has become the habitual and accredited spiritual attitude for the members of the group; when the fight has become the dominant note in the current theory of life; when the common-sense appreciation of men and things has come to be an appreciation with a view to combat. The substantial difference between the peaceable and the predatory phase of culture, therefore, is a spiritual difference, not a mechanical one. The change in spiritual attitude is the outgrowth of a change in the material facts of the life of the group, and it comes on gradually as the material circumstances favourable to a predatory attitude supervene. The inferior limit of the predatory culture is an industrial limit. Predation can not become the habitual, conventional resource of any group or any class until industrial methods have been developed to such a degree of efficiency as to leave a margin worth fighting for, above the subsistence of those engaged in getting a living. The transition from peace to predation therefore depends on the growth of technical knowledge and the use of tools. A predatory culture is similarly impracticable in early times, until weapons have been developed to such a point as to make man a formidable animal. The early development of tools and of weapons is of course the same fact seen from two different points of view. The life of a given group would be characterised as peaceable so long as habitual recourse to combat has not brought the fight into the foreground in men’s every day thoughts, as a dominant feature of the life of man. A group may evidently attain such a predatory attitude with a greater or less degree of completeness, so that its scheme of life and canons of conduct may be controlled to a greater or less extent by the predatory animus. The predatory phase of culture is therefore conceived to come on gradually, through a cumulative growth of predatory aptitudes habits, and traditions this growth being due to a change in the circumstances of the group’s life, of such a kind as to develop and conserve those traits of human nature and those traditions and norms of conduct that make for a predatory rather than a peaceable life. The evidence for the hypothesis that there has been such a peaceable stage of primitive culture is in great part drawn from psychology rather than from ethnology, and cannot be detailed here. It will be recited in part in a later chapter, in discussing the survival of archaic traits of human nature under the modern culture. 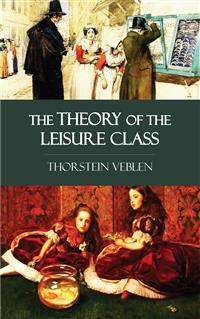 IN THE SEQUENCE OF CULTURAL evolution the emergence of a leisure class coincides with the beginning of ownership. This is necessarily the case, for these two institutions result from the same set of economic forces. In the inchoate phase of their development they are but different aspects of the same general facts of social structure. It is as elements of social structure—conventional facts—that leisure and ownership are matters of interest for the purpose in hand. An habitual neglect of work does not constitute a leisure class; neither does the mechanical fact of use and consumption constitute ownership. The present inquiry, therefore, is not concerned with the beginning of indolence, nor with the beginning of the appropriation of useful articles to individual consumption. The point in question is the origin and nature of a conventional leisure class on the one hand and the beginnings of individual ownership as a conventional right or equitable claim on the other hand. The early differentiation out of which the distinction between a leisure and a working class arises is a division maintained between men’s and women’s work in the lower stages of barbarism. Likewise the earliest form of ownership is an ownership of the women by the able bodied men of the community. The facts may be expressed in more general terms, and truer to the import of the barbarian theory of life, by saying that it is an ownership of the woman by the man. There was undoubtedly some appropriation of useful articles before the custom of appropriating women arose. The usages of existing archaic communities in which there is no ownership of women is warrant for such a view. In all communities the members, both male and female, habitually appropriate to their individual use a variety of useful things; but these useful things are not thought of as owned by the person who appropriates and consumes them. The habitual appropriation and consumption of certain slight personal effects goes on without raising the question of ownership; that is to say, the question of a conventional, equitable claim to extraneous things. The ownership of women begins in the lower barbarian stages of culture, apparently with the seizure of female captives. The original reason for the seizure and appropriation of women seems to have been their usefulness as trophies. The practice of seizing women from the enemy as trophies, gave rise to a form of ownership-marriage, resulting in a household with a male head. This was followed by an extension of slavery to other captives and inferiors, besides women, and by an extension of ownership-marriage to other women than those seized from the enemy. The outcome of emulation under the circumstances of a predatory life, therefore, has been on the one hand a form of marriage resting on coercion, and on the other hand the custom of ownership. The two institutions are not distinguishable in the initial phase of their development; both arise from the desire of the successful men to put their prowess in evidence by exhibiting some durable result of their exploits. Both also minister to that propensity for mastery which pervades all predatory communities. From the ownership of women the concept of ownership extends itself to include the products of their industry, and so there arises the ownership of things as well as of persons. In this way a consistent system of property in goods is gradually installed. And although in the latest stages of the development, the serviceability of goods for consumption has come to be the most obtrusive element of their value, still, wealth has by no means yet lost its utility as a honorific evidence of the owner’s prepotence. Wherever the institution of private property is found, even in a slightly developed form, the economic process bears the character of a struggle between men for the possession of goods. It has been customary in economic theory, and especially among those economists who adhere with least faltering to the body of modernised classical doctrines, to construe this struggle for wealth as being substantially a struggle for subsistence. Such is, no doubt, its character in large part during the earlier and less efficient phases of industry. Such is also its character in all cases where the “niggardliness of nature” is so strict as to afford but a scanty livelihood to the community in return for strenuous and unremitting application to the business of getting the means of subsistence. But in all progressing communities an advance is presently made beyond this early stage of technological development. Industrial efficiency is presently carried to such a pitch as to afford something appreciably more than a bare livelihood to those engaged in the industrial process. It has not been unusual for economic theory to speak of the further struggle for wealth on this new industrial basis as a competition for an increase of the comforts of life,—primarily for an increase of the physical comforts which the consumption of goods affords. The end of acquisition and accumulation is conventionally held to be the consumption of the goods accumulated—whether it is consumption directly by the owner of the goods or by the household attached to him and for this purpose identified with him in theory. This is at least felt to be the economically legitimate end of acquisition, which alone it is incumbent on the theory to take account of. Such consumption may of course be conceived to serve the consumer’s physical wants—his physical comfort—or his so-called higher wants—spiritual, aesthetic, intellectual, or what not; the latter class of wants being served indirectly by an expenditure of goods, after the fashion familiar to all economic readers. But it is only when taken in a sense far removed from its naive meaning that consumption of goods can be said to afford the incentive from which accumulation invariably proceeds. The motive that lies at the root of ownership is emulation; and the same motive of emulation continues active in the further development of the institution to which it has given rise and in the development of all those features of the social structure which this institution of ownership touches. The possession of wealth confers honour; it is an invidious distinction. Nothing equally cogent can be said for the consumption of goods, nor for any other conceivable incentive to acquisition, and especially not for any incentive to accumulation of wealth. It is of course not to be overlooked that in a community where nearly all goods are private property the necessity of earning a livelihood is a powerful and ever present incentive for the poorer members of the community. The need of subsistence and of an increase of physical comfort may for a time be the dominant motive of acquisition for those classes who are habitually employed at manual labour, whose subsistence is on a precarious footing, who possess little and ordinarily accumulate little; but it will appear in the course of the discussion that even in the case of these impecunious classes the predominance of the motive of physical want is not so decided as has sometimes been assumed. On the other hand, so far as regards those members and classes of the community who are chiefly concerned in the accumulation of wealth, the incentive of subsistence or of physical comfort never plays a considerable part. Ownership began and grew into a human institution on grounds unrelated to the subsistence minimum. The dominant incentive was from the outset the invidious distinction attaching to wealth, and, save temporarily and by exception, no other motive has usurped the primacy at any later stage of the development. Property set out with being booty held as trophies of the successful raid. So long as the group had departed and so long as it still stood in close contact with other hostile groups, the utility of things or persons owned lay chiefly in an invidious comparison between their possessor and the enemy from whom they were taken. The habit of distinguishing between the interests of the individual and those of the group to which he belongs is apparently a later growth. Invidious comparison between the possessor of the honorific booty and his less successful neighbours within the group was no doubt present early as an element of the utility of the things possessed, though this was not at the outset the chief element of their value. The man’s prowess was still primarily the group’s prowess, and the possessor of the booty felt himself to be primarily the keeper of the honour of his group. This appreciation of exploit from the communal point of view is met with also at later stages of social growth, especially as regards the laurels of war. But as soon as the custom of individual ownership begins to gain consistency, the point of view taken in making the invidious comparison on which private property rests will begin to change. Indeed, the one change is but the reflex of the other. The initial phase of ownership, the phase of acquisition by naive seizure and conversion, begins to pass into the subsequent stage of an incipient organization of industry on the basis of private property (in slaves); the horde develops into a more or less self-sufficing industrial community; possessions then come to be valued not so much as evidence of successful foray, but rather as evidence of the prepotence of the possessor of these goods over other individuals within the community. The invidious comparison now becomes primarily a comparison of the owner with the other members of the group. Property is still of the nature of trophy, but, with the cultural advance, it becomes more and more a trophy of successes scored in the game of ownership carried on between the members of the group under the quasi-peaceable methods of nomadic life. Gradually, as industrial activity further displaced predatory activity in the community’s everyday life and in men’s habits of thought, accumulated property more and more replaces trophies of predatory exploit as the conventional exponent of prepotence and success. With the growth of settled industry, therefore, the possession of wealth gains in relative importance and effectiveness as a customary basis of repute and esteem. Not that esteem ceases to be awarded on the basis of other, more direct evidence of prowess; not that successful predatory aggression or warlike exploit ceases to call out the approval and admiration of the crowd, or to stir the envy of the less successful competitors; but the opportunities for gaining distinction by means of this direct manifestation of superior force grow less available both in scope and frequency. At the same time opportunities for industrial aggression, and for the accumulation of property, increase in scope and availability. And it is even more to the point that property now becomes the most easily recognised evidence of a reputable degree of success as distinguished from heroic or signal achievement. It therefore becomes the conventional basis of esteem. Its possession in some amount becomes necessary in order to any reputable standing in the community. It becomes indispensable to accumulate, to acquire property, in order to retain one’s good name. When accumulated goods have in this way once become the accepted badge of efficiency, the possession of wealth presently assumes the character of an independent and definitive basis of esteem. The possession of goods, whether acquired aggressively by one’s own exertion or passively by transmission through inheritance from others, becomes a conventional basis of reputability. The possession of wealth, which was at the outset valued simply as an evidence of efficiency, becomes, in popular apprehension, itself a meritorious act. Wealth is now itself intrinsically honourable and confers honour on its possessor. By a further refinement, wealth acquired passively by transmission from ancestors or other antecedents presently becomes even more honorific than wealth acquired by the possessor’s own effort; but this distinction belongs at a later stage in the evolution of the pecuniary culture and will be spoken of in its place. Prowess and exploit may still remain the basis of award of the highest popular esteem, although the possession of wealth has become the basis of common place reputability and of a blameless social standing. The predatory instinct and the consequent approbation of predatory efficiency are deeply ingrained in the habits of thought of those peoples who have passed under the discipline of a protracted predatory culture. According to popular award, the highest honours within human reach may, even yet, be those gained by an unfolding of extraordinary predatory efficiency in war, or by a quasi-predatory efficiency in statecraft; but for the purposes of a commonplace decent standing in the community these means of repute have been replaced by the acquisition and accumulation of goods. In order to stand well in the eyes of the community, it is necessary to come up to a certain, somewhat indefinite, conventional standard of wealth; just as in the earlier predatory stage it is necessary for the barbarian man to come up to the tribe’s standard of physical endurance, cunning, and skill at arms. A certain standard of wealth in the one case, and of prowess in the other, is a necessary condition of reputability, and anything in excess of this normal amount is meritorious. Those members of the community who fall short of this, somewhat indefinite, normal degree of prowess or of property suffer in the esteem of their fellow-men; and consequently they suffer also in their own esteem, since the usual basis of self-respect is the respect accorded by one’s neighbours. Only individuals with an aberrant temperament can in the long run retain their self-esteem in the face of the disesteem of their fellows. Apparent exceptions to the rule are met with, especially among people with strong religious convictions. But these apparent exceptions are scarcely real exceptions, since such persons commonly fall back on the putative approbation of some supernatural witness of their deeds. So soon as the possession of property becomes the basis of popular esteem, therefore, it becomes also a requisite to the complacency which we call self-respect. In any community where goods are held in severalty it is necessary, in order to his own peace of mind, that an individual should possess as large a portion of goods as others with whom he is accustomed to class himself; and it is extremely gratifying to possess something more than others. But as fast as a person makes new acquisitions, and becomes accustomed to the resulting new standard of wealth, the new standard forthwith ceases to afford appreciably greater satisfaction than the earlier standard did. The tendency in any case is constantly to make the present pecuniary standard the point of departure for a fresh increase of wealth; and this in turn gives rise to a new standard of sufficiency and a new pecuniary classification of one’s self as compared with one’s neighbours. So far as concerns the present question, the end sought by accumulation is to rank high in comparison with the rest of the community in point of pecuniary strength. So long as the comparison is distinctly unfavourable to himself, the normal, average individual will live in chronic dissatisfaction with his present lot; and when he has reached what may be called the normal pecuniary standard of the community, or of his class in the community, this chronic dissatisfaction will give place to a restless straining to place a wider and ever-widening pecuniary interval between himself and this average standard. The invidious comparison can never become so favourable to the individual making it that he would not gladly rate himself still higher relatively to his competitors in the struggle for pecuniary reputability. In the nature of the case, the desire for wealth can scarcely be satiated in any individual instance, and evidently a satiation of the average or general desire for wealth is out of the question. However widely, or equally, or “fairly”, it may be distributed, no general increase of the community’s wealth can make any approach to satiating this need, the ground of which is the desire of every one to excel every one else in the accumulation of goods. If, as is sometimes assumed, the incentive to accumulation were the want of subsistence or of physical comfort, then the aggregate economic wants of a community might conceivably be satisfied at some point in the advance of industrial efficiency; but since the struggle is substantially a race for reputability on the basis of an invidious comparison, no approach to a definitive attainment is possible. What has just been said must not be taken to mean that there are no other incentives to acquisition and accumulation than this desire to excel in pecuniary standing and so gain the esteem and envy of one’s fellow-men. The desire for added comfort and security from want is present as a motive at every stage of the process of accumulation in a modern industrial community; although the standard of sufficiency in these respects is in turn greatly affected by the habit of pecuniary emulation. To a great extent this emulation shapes the methods and selects the objects of expenditure for personal comfort and decent livelihood. Besides this, the power conferred by wealth also affords a motive to accumulation. That propensity for purposeful activity and that repugnance to all futility of effort which belong to man by virtue of his character as an agent do not desert him when he emerges from the naive communal culture where the dominant note of life is the unanalysed and undifferentiated solidarity of the individual with the group with which his life is bound up. When he enters upon the predatory stage, where self-seeking in the narrower sense becomes the dominant note, this propensity goes with him still, as the pervasive trait that shapes his scheme of life. The propensity for achievement and the repugnance to futility remain the underlying economic motive. The propensity changes only in the form of its expression and in the proximate objects to which it directs the man’s activity. Under the regime of individual ownership the most available means of visibly achieving a purpose is that afforded by the acquisition and accumulation of goods; and as the self-regarding antithesis between man and man reaches fuller consciousness, the propensity for achievement—the instinct of workmanship—tends more and more to shape itself into a straining to excel others in pecuniary achievement. Relative success, tested by an invidious pecuniary comparison with other men, becomes the conventional end of action. The currently accepted legitimate end of effort becomes the achievement of a favourable comparison with other men; and therefore the repugnance to futility to a good extent coalesces with the incentive of emulation. It acts to accentuate the struggle for pecuniary reputability by visiting with a sharper disapproval all shortcoming and all evidence of shortcoming in point of pecuniary success. Purposeful effort comes to mean, primarily, effort directed to or resulting in a more creditable showing of accumulated wealth. Among the motives which lead men to accumulate wealth, the primacy, both in scope and intensity, therefore, continues to belong to this motive of pecuniary emulation. In making use of the term “invidious”, it may perhaps be unnecessary to remark, there is no intention to extol or depreciate, or to commend or deplore any of the phenomena which the word is used to characterise. The term is used in a technical sense as describing a comparison of persons with a view to rating and grading them in respect of relative worth or value—in an aesthetic or moral sense—and so awarding and defining the relative degrees of complacency with which they may legitimately be contemplated by themselves and by others. An invidious comparison is a process of valuation of persons in respect of worth. IF ITS WORKING WERE NOT disturbed by other economic forces or other features of the emulative process, the immediate effect of such a pecuniary struggle as has just been described in outline would be to make men industrious and frugal. This result actually follows, in some measure, so far as regards the lower classes, whose ordinary means of acquiring goods is productive labour. This is more especially true of the labouring classes in a sedentary community which is at an agricultural stage of industry, in which there is a considerable subdivision of industry, and whose laws and customs secure to these classes a more or less definite share of the product of their industry. These lower classes can in any case not avoid labour, and the imputation of labour is therefore not greatly derogatory to them, at least not within their class. Rather, since labour is their recognised and accepted mode of life, they take some emulative pride in a reputation for efficiency in their work, this being often the only line of emulation that is open to them. For those for whom acquisition and emulation is possible only within the field of productive efficiency and thrift, the struggle for pecuniary reputability will in some measure work out in an increase of diligence and parsimony. But certain secondary features of the emulative process, yet to be spoken of, come in to very materially circumscribe and modify emulation in these directions among the pecuniary inferior classes as well as among the superior class. But it is otherwise with the superior pecuniary class, with which we are here immediately concerned. For this class also the incentive to diligence and thrift is not absent; but its action is so greatly qualified by the secondary demands of pecuniary emulation, that any inclination in this direction is practically overborne and any incentive to diligence tends to be of no effect. The most imperative of these secondary demands of emulation, as well as the one of widest scope, is the requirement of abstention from productive work. This is true in an especial degree for the barbarian stage of culture. During the predatory culture labour comes to be associated in men’s habits of thought with weakness and subjection to a master. It is therefore a mark of inferiority, and therefore comes to be accounted unworthy of man in his best estate. By virtue of this tradition labour is felt to be debasing, and this tradition has never died out. On the contrary, with the advance of social differentiation it has acquired the axiomatic force due to ancient and unquestioned prescription. In order to gain and to hold the esteem of men it is not sufficient merely to possess wealth or power. The wealth or power must be put in evidence, for esteem is awarded only on evidence. And not only does the evidence of wealth serve to impress one’s importance on others and to keep their sense of his importance alive and alert, but it is of scarcely less use in building up and preserving one’s self-complacency. In all but the lowest stages of culture the normally constituted man is comforted and upheld in his self-respect by “decent surroundings” and by exemption from “menial offices”. Enforced departure from his habitual standard of decency, either in the paraphernalia of life or in the kind and amount of his everyday activity, is felt to be a slight upon his human dignity, even apart from all conscious consideration of the approval or disapproval of his fellows. The archaic theoretical distinction between the base and the honourable in the manner of a man’s life retains very much of its ancient force even today. So much so that there are few of the better class who are not possessed of an instinctive repugnance for the vulgar forms of labour. We have a realising sense of ceremonial uncleanness attaching in an especial degree to the occupations which are associated in our habits of thought with menial service. It is felt by all persons of refined taste that a spiritual contamination is inseparable from certain offices that are conventionally required of servants. Vulgar surroundings, mean (that is to say, inexpensive) habitations, and vulgarly productive occupations are unhesitatingly condemned and avoided. They are incompatible with life on a satisfactory spiritual plane __ with “high thinking”. From the days of the Greek philosophers to the present, a degree of leisure and of exemption from contact with such industrial processes as serve the immediate everyday purposes of human life has ever been recognised by thoughtful men as a prerequisite to a worthy or beautiful, or even a blameless, human life. In itself and in its consequences the life of leisure is beautiful and ennobling in all civilised men’s eyes. This direct, subjective value of leisure and of other evidences of wealth is no doubt in great part secondary and derivative. It is in part a reflex of the utility of leisure as a means of gaining the respect of others, and in part it is the result of a mental substitution. The performance of labour has been accepted as a conventional evidence of inferior force; therefore it comes itself, by a mental short-cut, to be regarded as intrinsically base. During the predatory stage proper, and especially during the earlier stages of the quasi-peaceable development of industry that follows the predatory stage, a life of leisure is the readiest and most conclusive evidence of pecuniary strength, and therefore of superior force; provided always that the gentleman of leisure can live in manifest ease and comfort. At this stage wealth consists chiefly of slaves, and the benefits accruing from the possession of riches and power take the form chiefly of personal service and the immediate products of personal service. Conspicuous abstention from labour therefore becomes the conventional mark of superior pecuniary achievement and the conventional index of reputability; and conversely, since application to productive labour is a mark of poverty and subjection, it becomes inconsistent with a reputable standing in the community. Habits of industry and thrift, therefore, are not uniformly furthered by a prevailing pecuniary emulation. On the contrary, this kind of emulation indirectly discountenances participation in productive labour. Labour would unavoidably become dishonourable, as being an evidence indecorous under the ancient tradition handed down from an earlier cultural stage. The ancient tradition of the predatory culture is that productive effort is to be shunned as being unworthy of able-bodied men, and this tradition is reinforced rather than set aside in the passage from the predatory to the quasi-peaceable manner of life. Even if the institution of a leisure class had not come in with the first emergence of individual ownership, by force of the dishonour attaching to productive employment, it would in any case have come in as one of the early consequences of ownership. And it is to be remarked that while the leisure class existed in theory from the beginning of predatory culture, the institution takes on a new and fuller meaning with the transition from the predatory to the next succeeding pecuniary stage of culture. It is from this time forth a “leisure class” in fact as well as in theory. From this point dates the institution of the leisure class in its consummate form.